What are health and safety bulletins? 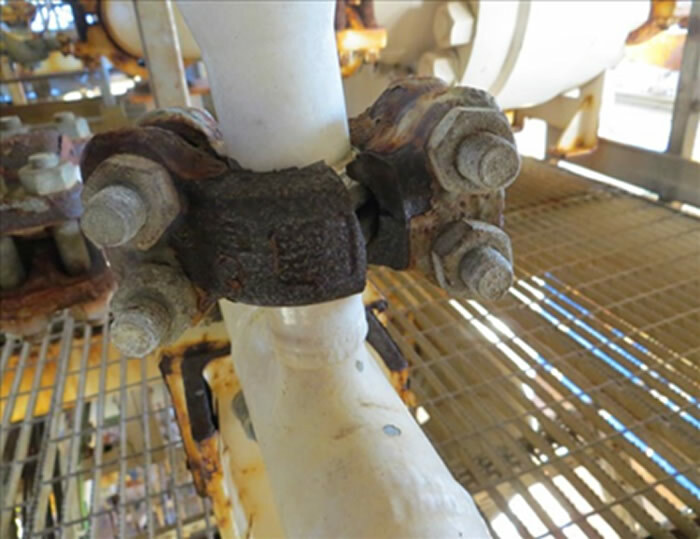 This Safety Alert highlights the issue of inadequate material properties of small diameter clamp connectors and the potential for sudden brittle failure. Further enquiry has revealed similar failures on other small-sized (1”, 1½” and 2” diameter) clamp connector segments. The primary cause of failure of the clamp was due to hydrogen cracking. Evidence from this clamp and others checked later indicates that high hardness, with values in excess of 48-50HRC (Rockwell hardness value), being the underlying cause. High hardness increases the material’s susceptibility to cracking in general from reduced ductility. Investigations revealed that prior to 2010 the clamps, which require quench and temper heat treatment, were not subject to 100% hardness testing. Hence the quality controls were not sufficient to detect components that had received improper heat treatment and lacked ductility. Clamp connector segments are produced by a forging process in a number of foundries in the UK and are manufactured from AISI 4140 alloy steel with a recommended Rockwell hardness value of 22HRC. To date all defective clamps found were produced by one manufacturer (George Dykes) and supplied to Vector Technology Group (Techlok) up until 2010. These were limited to 2” diameter clamps and below. It has subsequently been established that the similar ‘G’ clamp supplied by Destec Engineering, was also manufactured by George Dykes. A Destec ‘G’ clamp is also known to have failed in service in 2014. The confirmed numbers of failed clamps is low and they appear to be random and not batch related, therefore it is not possible to identify them through heat numbers or heat treatment records. Duty Holders should identify if they have in use any 2” or below Techlok or Destec ‘G’ clamp connectors supplied before 2010, or have the potential to be used (for example spares kept in stores) on any of their installations and to verify their fitness for service. Verification could be established from supplier records whereby the material properties of the clamps are fully certified, or by appropriate NDT inspection and hardness tests. Any found to exceed acceptable hardness values must be taken out of service. Note; clamp segments may also have been supplied by other vendors along with their main products (e.g. valve assemblies) and duty holders should ensure that these are subject to the same checks. The evidence suggests that segments manufactured after 2010 will not require inspection and hardness checks. There are a number of suppliers of this type of clamp. Whilst distinguishing the Techlok or Destec versions from the others is possible through raised stamp marks on the hub, this is likely to become increasingly more difficult after a period in service. In such circumstances to ensure fitness for service it will be likely that all small diameter clamp connectors will require hardness checking. Offshore Installations (Prevention of Fire & Explosion, and Emergency Response) Regulations 1995, Regulation 9. Provision & Use of Work Equipment Regulations, 1998, Regulation 5.